For the whole list of changes and new features see the release notes for 1.2.0, 1.2.1, 1.2.2, 1.2.3, 1.2.5 and 1.2.6. Added support for Machinekit G-code flavor. Pan & zoom with mouse in the 2D Layers preview. Load files into GUI when supplied from command line along with the –gui switch (#2644). Simpler and more robust implementation of Extra perimeters, which are now added only when at least 30% of the upper perimeters loops will benefit from them (#2395, #2664, #2610). 3D views are now synced (#2628). Better and more robust implementation of Infill only where needed. When using raft, First layer height is now validated only with nozzle diameter of support material extruder thus allowing the usage of a larger nozzle for it (#2701, #2722). Support material layer height is used for raft layers instead of object layer height (#2723). A [scale] placeholder is now available for filenames and custom G-code (#2791). Better and more robust medial axis implementation for thin wall handling (#2800, #2829). 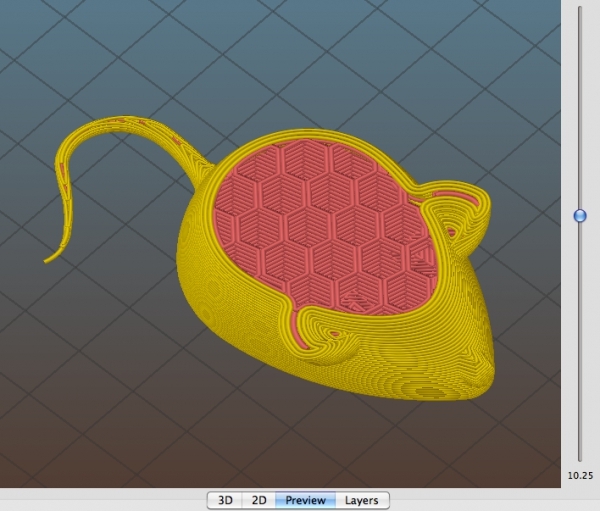 Brim and skirt are now rendered in the 3D toolpaths preview (#2649). Speed improvements to Avoid crossing perimeters (#2777). The [layer_num] placeholder now uses a single continuous series also when using interlaced support material layers (#2634). Fixed crash occurring on version check on Linux (#2641). Fixed buttons size on Linux (#2642). Don’t use bridge speed for first object layer above raft when support_material_contact_distance > 0 (#2656). Fixed upstream issue causing some infill paths not being clipped correctly to object contours (#2448). Fixed regression causing [input_filename] and [input_filename_base] not to be available anymore in custom G-code (#1507). Background processing was not restarted when the previous one failed because of a config validation error (#2633). Fixed support material not always honoring the custom first layer extrusion width (#2662). Fixed upstream issue causing shortcutting perimeters (#2639). Fixed infill/perimeters overlap setting not correctly working in some edge cases (#2632). Fixed first layer support material spacing (#2662). Fixed too many skirt layers being printed when using tall skirts and support material (#2695). Fixed regression causing failures in bridge direction detection (#2636). Fixed Z clipping in OpenGL 3D rendering. Fixed error in executability check for post-processing scripts on Windows (#2616). Fixed temperature not being set correctly when using sequential printing (#2702). Fixed potential collision when using wipe and sequential printing (#2691). Fixed problems with non-ASCII filenames and directory paths on Windows (#2710). Fixed layers view not being resized when inactive (#2708). 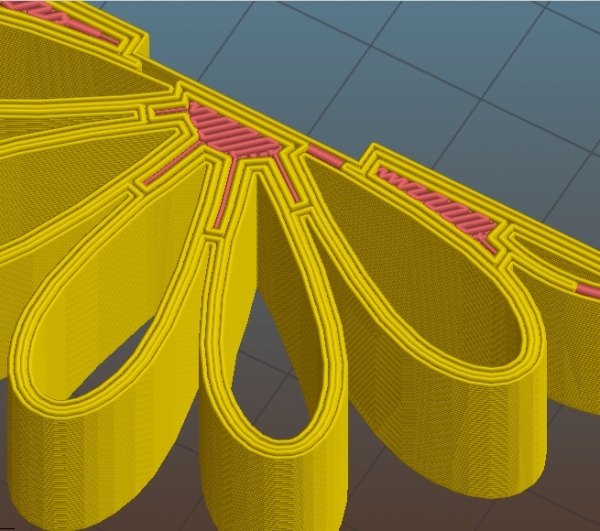 Fixed order of concentric infill loops. Fixed object Z alignment after cut + rotate (#2724). Fixed superflous and potentially harmful travel moves when moving between objects with sequential printing (#2691). Fixed dirty filament options being ignored when using multiple extruders (#2740, patch by @markwal). Fixed the Export G-code button not being re-enabled after a cancelled export job (#2754). Fixed the object parts editor being opened in an invalid status until user clicked on an item in the parts tree (#2762). Fixed regression causing spiral vase logic not to be disabled on layers with multiple loops (#2761). Fixed Resolution option not triggering automatic reslicing (#2795). Fixed wrong object positions caused by splitting a rotated object (#2772). Fixed crash on Windows when deleting the first object part (#2774). Fixed double or overlapping gap fill in some cases (#2836, #2474). Fixed regression causing skirt not to be exported in G-code when Raft layers were used (#2843). Added workaround for upstream wxWidgets bug causing numeric controls to revert their value on OS X (#2612).